We currently have a superb business for sale in Liverpool and the Wirral which has been operating for the last 20 years and was opened as a brand new centre by the current owners. This is a fantastic franchise opportunity that already has an existing client database and further opportunity for continued growth, someone looking for the freedom to run their own business with the support of the UK's leading franchise Sign company should seriously consider this proposition. You'll be taking on an extremely established franchise that has grown steadily over the years, the centre has a highly skilled team in place, meaning the new owner can focus on continued business growth and development, building on the solid foundations left by the existing franchisee. Clear systems and high-quality standards will allow a new franchisee to step straight into the role. Plus, you’ll have the added benefit of a dedicated support team from Signs Express Franchise Support Centre covering all aspects of the business. Due to its central location, this business would suit those based, or looking to relocate to Liverpool, Wirral and surrounding areas. There remains tremendous scope to utilise the trading history, full potential of the assets and the territory, along with assistance from our Franchise Support Centre, to grow the already extensive customer base. 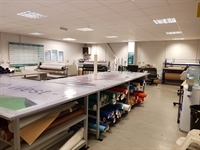 Having established a modern and efficient production facility; the owners have established a varied client base and from that, developed a solid reputation locally for best quality signage and graphics, at fair prices. A mixture of ongoing contracts and referrals from local businesses means this busy centre has had strong and consistent growth since its inception. A full schedule of training is provided before you begin and support is available throughout your position as a Signs Express franchisee.